Mythology- a collection of myths, especially one belonging to a particular religious or cultural tradition. Pantheon- gods of a particular country or group of people; a temple that is built to honor all the gods of a particular group of people or country. Example: Ganesha. Hindu deity of Success, Wisdom and Prudence. They've been the focus of our world. In movies such as Clash of the Titans or comic book icons like Thor and Wonder Woman, they've thrilled us with their adventures of might against mythic creatures and what-have-you. But believe it or not, their creation was delved into world mythology. Comics and fantasy writers have sometimes turned to a particular mythology to create characters that are modern takes on the likes of Hera, the Furies, and Zeus himself. Authors Rick Riordan and Kasey Mackenzie fit the bill. On the matter of Thor, when Stan Lee and Jack Kirby created him in 1962, they provided him a human alter-ego, a human love interest, and mundane issues to tie him to Earth. Likewise, Percy Jackson was given human foibles and mundane problems to help make him accessible and identifiable for readers who do not have amazing powers. *According to Peter David, creating heroes with feet of clay is more than a just a clever marketing gimmick. Intentionally or not, it also serves to bring modern superheroes more in line with the classic tradition of making everyone from the greatest heroes and the mightiest of gods as capable of messing up as the lowliest of mortals. And that's a time honored practice. Gods were fine instigators and troublemakers, but the memorable heroes were born from unions between gods/godlings and mortals (Hercules, son of Zeus and a mortal woman; Achillies, son of a king and a water nymph). Like Thor, they had human weaknesses and mortality as a part of their make up. Of course, no one has to be a god to have roots in godhood. For instance, the Hulk is an almagam of Jekyll and Hyde, Frankenstein's monster, Prometheus, and Greta Garbo. Only difference is that he endlessly wishes to "just be left alone" but that never happened. Look to books on mythology and the constant role of the hero and his relationship with gods as a guide to traveling the mythic route. 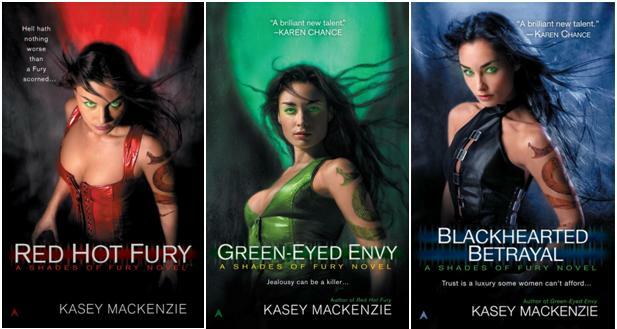 Mackenzie would tell you about her sources of myth and legends that spawned her Shades of Fury series. For all I know, she might've looked up Bulfinch's Mythology, by Thomas Bulfinch, as a source for her works. One thing to keep in mind about building your story on myth: It's not the source that matters; it's what you do with it that makes it all yours. For any CCers looking to have fun with the idea, here's a writing prompt from *Writing for Comics & Graphic Novels with Peter David. Read up on an ancient pantheon: Egyptian, Hindu, Norse, Chinese, Greek. Select a god who has qualities and/or a personality that appeals to you. Produce a superhero who is a modern day incarnation of that character. Produce a villain who is either drawn from the same mythology, or from another where he would serve to compliment the hero. Work up a story arc that brings the two together in conflict. And there you have it. Another idea for the up & coming writer of fantasy or comic books. Dig up those mythology textbooks, look up a website like the Encyclopedia Mythica or Bulfinch himself. Give life to your mythology based adventures. *Source: Writing for Comics & Graphic Novels with Peter David, pg. 52-54. Greta Garbo . . . lol. One reason we recur to these traditional mythologies as story sources is that it's hard to make up a really good one from scratch. The counter-example — a powerful pantheon that was made from scratch — is Jack Kirby's "Fourth World." Of course you can find echoes of classic tropes there, as in every good story, and there are some minor ties to Superman and Jimmy Olsen and such. But by and large Apokolips and the New Gods are entirely original. Yet they have that genuine mythic flavor to them. And Darkseid is one of the best villains ever. I am such a young fella! lol I never knew how The King had to establish the Fourth World from scratch. It's all pretty much a Kirby creation, I think. But actually, there is a connection too: Kirby had thought about writing something that would take place after the Norse gods' Ragnarok, on the version that projects a 'new heaven and new earth' afterwards. It didn't fly as a Thor storyline. But that's what sparked the New Gods (which is why they're new) — you can see the connection in the opening sequence. And of course the fantasy-as-science-fiction style of the Fourth World is very similar to what Marvel did much later with the Thor movies — so it all wraps around. As Tolkien said, everyone draws something out of the Cauldron of Story, and puts something else back in . . . I see what you mean on the Tolkien quote, Rellrod. "It's not the source that matters"
Mind you, if you're going to disregard the source, kindly don't hijack names from the source. It just makes the myth geeks disappointed, and it looks like those B movies claiming to tell "the real story" of an event (say, the sinking of the titanic) while at the same time adding rapping dogs, levitating dolphins and the ship doesn't actually sink it's saved by a giant octopus. Either at least try to be accurate, or make your completely own thing without borrowing names.